Spring is officially here, and for most of us, that means beautiful weather, vacations and the inevitable spring cleaning. To help you with this daunting task, retailers like Walmart are slashing the prices on top-brand cleaning appliances that can normally be quite pricey. Right now you can get the Dyson DC33 Upright Vacuum on sale for $179.99. That's a $100 discount and the best price we've seen for the bagless vacuum. The Dyson vacuum cleaner works on all indoor surfaces so you can seamlessly clean your carpets, tile and wood floors without having to switch inputs or change the vacuum head. The powerful DC33 features root cyclone technology and a lifetime HEPA filter to capture dirt and microscopic particles and remove allergens and bacteria from your home. Because this vacuum is bagless, the dirt is stored in a hygienic bin that's conveniently released with a push of the button. 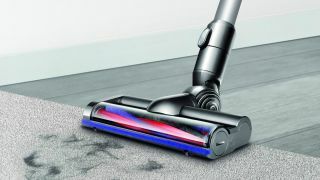 The Dyson DC33 includes a wand and hose that releases in one smooth action and includes tools to help clean hard to reach areas such as curtains, stairs, ceilings and more. If you're interested in a cordless vacuum cleaner, Amazon has the best-selling Dyson V6 Motorhead Vacuum on sale for $149.99. The powerful V6 offers 75% more brush bar power than the V6 Cord-free vacuum and the motorized head can clean any floor type.